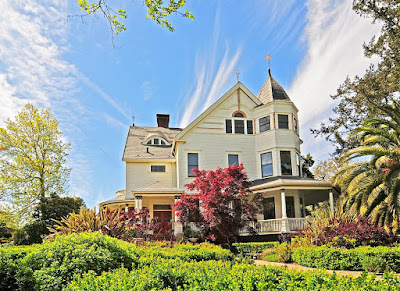 The Fairbanks House of Petaluma, California was on the market in 2013 for $2,345,000. This house was on the market in March 1997 for $995,000. My wife and I toured the house when it was for sale in 1997 and fantasized about buying the house for a B&B. A pair of San Francisco architects designed this 8,500 square foot house for Hiram T. Fairbanks in 1890. Hiram Talbert Fairbanks 1827-1915 is my 3rd great grand uncle. Our common ancestors are Sheldon Fairbanks and Mercy Ann Sage. One of my favorite surnames in my own family history is Fairbanks. This is the surname that first got me interested in researching my family history. My grandmother, Elaine Coffman Kelly, had told me stories about being related to the Fairbanks House of Dedham, Massachussetts. I visited the Fairbanks House in 1984 five years before I began my genealogical quest. 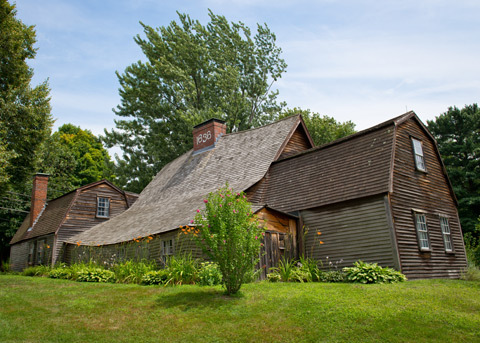 My wife and I drove a rental car from Boston to Dedham and pulled up in front of the house which is a house museum maintained by the Fairbanks Family in America, Inc. since 1904. From the curb we could see that there was a sign in front of the house that said "CLOSED FOR SPECIAL EVENT". Having traveled from coast to coast we could not believe our misfortune to arrive at the house on a day that it was closed to visitors. I have never had any hesitation about knocking on doors. I trotted up to the entry to find out what was happening. The gentleman who answered the door told me that the museum was closed for a FAMILY REUNION! Suddenly my face brightened and I exclaimed that "I was a member of the family" and we had come all the way from the west coast to see the museum. The gracious gentleman ushered us inside and gave us the full tour! As the family reunion festivities began to draw to a close, one of my new-found cousins asked me how we were related to the Fairbanks family. I had no idea, but this became one of the first research projects for me when I commenced this genealogical quest, five years later. I knew that the Fairbanks house was built by and for the original Fairbanks immigrants, Jonathan Fairbanke and his wife, Grace Smith but I did not how my grandmother was connected. I learned that Gram Elaine's grandmother was Harriett Anne Ketcham [1853-1938] and that she married Archibald Coffman. Her death certificate gave the names of her parents, James Ketcham and Lucinda Fairbanks. So there was my connection. Her full name was Mary Lucinda Fairbanks. She was the daughter of Sheldon Fairbanks and Mercy Ann Sage. She had a brother, named Hiram Talbert Fairbanks. She became my connection to two Fairbanks family homes on both the Atlantic and the Pacific coasts. This portrait of Hiram T. Fairbanks with his signature was published on page 488 of the Genealogy of the Fairbanks Family in America 1633-1897. by Lorenzo Sayles Fairbanks, A.M. The book was originally printed for the author and was distributed by subscription. Hiram T. Fairbanks was acknowledged by the author as a sponsor of the genealogy. Digital copies of the book are available at Archive.org and Ancestry.com which is where this image was obtained. My 2nd great grandmother, Harriet Anne Ketcham [1853-1938] was listed on page 262 of the Fairbanks Genealogy. As one of the oldest settlers and successful business men of Petaluma Hiram T. Fairbanks is deserving of mention in a history of Sonoma county. A native of Indiana, he was born in Manchester, Dearborn county, December 29, 1827, on the paternal farm, and he was educated in the country schools of that time and place. When he was about nineteen years of age, in 1846, he ventured out in the world on his own responsibility, at that time going to Augusta, Des Moines county, Iowa, and making his home with the Hon. Levi Moffet. The following year he enlisted in the United States army for service in the Mexican war. The year 1849 found him in Indiana once more, but his stay there was brief, for the same year found him starting on the overland trip for the Pacific coast. Mining had been the attracting magnet in bringing him hither, and with his brothers he mined at what was then known as Mormon Island, on the south fork of the American river, about twenty-five miles from Sacramento. The venture proved successful, and with the proceeds of his labor he returned to Indiana by way of Panama in 1851 and the same year went to Iowa, where he followed merchandising. It was while he was in that state that Mr. Fairbanks was married to Miss Lucinda, the daughter of Hon. Levi Moffet, the ceremony being performed July 14, 1852. In addition to his mercantile interests he was also engaged in milling, continuing both enterprises until 1859, when he made a second trip to California, bringing with him across the plains his wife and four children. The fall of that year marked their arrival in Petaluma, where Mr. Fairbanks followed farming in connection with the lumber trade until the fall of 1861, discontinuing farming at that time, as he decided he was not fitted by nature for the work. 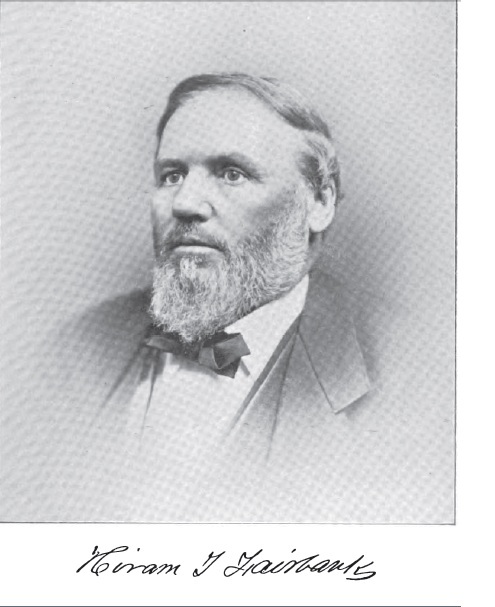 In the following year, 1862, he established himself in the mercantile business in Petaluma, a business which grew steadily with the passing of years, and in connection with which he also maintained a commission house in San Francisco. He continued in the merchandise business in Petaluma until 1869, when with his family he went east on a visit. His return to California in the fall of that year found him in Petaluma once more. During the year 1870 he gave up his commission business in San Francisco and in the winter of 1870-71 he again embarked in the mercantile trade, this time in company with the Hon. A. P. Whitney. Not only is Mr. Fairbanks regarded as one of Petaluma’s prominent and successful business men of former years, but he was equally well known and influential in financial circles. He was one of the founders of the Petaluma Savings Bank, which was organized in 1870, and was its manager and president until he retired from business. He was also president of the city board of trustees for several terms. In resigning from the presidency of the Golden Eagle Flour mills Mr. Fairbanks severed his connection with active business life, covering a long period of activity, and since then has been enjoying with his family the ease and comfort which his labors have made possible. Personally he is a man of fine character, and in the evening of life he can look over the past with the conviction that all that he has accomplished has been honestly accumulated, and added to this is the knowledge that he has the love and esteem of a large circle of friends and acquaintances. !FAMILY: For all children of Hiram Tolbert Fairbanks and Lucinda Moffett:L.S. Fairbanks Genealogy pp.488-489; Cypress Hill Cemetery grave stones and caretaker records examined by Jane Risser Aug.31, 1990. !For more information contact the following: Petaluma Historical Library and Museum, Fourth and B Streets, noon to 4 Thursday through Monday or Petaluma History Room at the Petaluma Library, 100 Fairgrounds Drive. !CENSUS: 1860 California, Sonoma Co., Petaluma Twp., 19 June 1860, Petaluma P.O., pg 558; Fam/Dwelling 141/141 Hiram Fairbank 31 Farmer $2500 RE $300 PE B-IN, Lucinda 27 IN, All children born Iowa: Isabella 7 , Adolphus 5, Augustus 3, Franklin 1; also enumerated with family are George Fairbank 37 Farmer IN & Jefferson Fairbank 13 IN. George is probably Hiram's older brother. Fairbanks, H. T. of Sonoma County, Calif. Republican. Delegate to Republican National Convention from California, 1880. Los Angeles Times (1881-1886) - Los Angeles, Calif. The Petaluma Fair will open August 28th. !CENSUS: 1900 California, Sonoma Co., Petaluma Twp., Petaluma City, ED 167 SH 7B LN 51, 658 D Street, Hiram T. Fairbanks B-Dec 1827 IN age 72, married 48 years, parents born NY, Bank President, owned free house. Lucinda, wife, B-Mar 1833 PA, age 67 mother of 11 children 10 living, parents B-NY & PA. Single Children: Dolphes B. son, Nov 1854 45 IA Bank Cashier; Ada E. Daughter Oct 1865 34 CA; William H. son Oct 1867 32 CA miner; Zorah daughter Aug 1872 27 CA; Dacia D. daughter Jan 1875 25 CA. Servant: Yee Kam male Sep 1868 31 China immigrated 1876 House servant. For fifty long years Mr. and Mrs. H.T. Fairbanks of this city have walked together hand in hand, up hill and down dale, along life's rugged highway. For fifty long years they have fought each other's battles and shared each others joys and sorrows. 'Tis a long journey for man and woman to make together, arriving at the fiftieth mile stone 'mid happy surroundings and with good cause to rejoice in the belief that many another mile stone lies gleaming in the bright future. This important event in the marital career of Mr. and Mrs. Fairbanks was most fittingly celebrated at their home on D street Monday afternoon, July 14, 1902. Hundreds of invitations had been sent to the hundreds of friends of the couple in response to the bidding they came far and near to pay their respects to their friends and each to add a word of congratulation. All the afternoon the guests who had been bidden to the golden anniversary came and went, as brilliant a throng as ever attended any social event in Petaluma. For the auspicious occasion, the Fairbanks' home was profusely but tastefully decorated in the rarest of the season's bloom's and greenery. Sprays of asparagus ferns, and smilax, with pretty marigold and other blooms peeping out from their green backgrounds, ornamented every nook and corner of the spacious hall and all the large reception rooms. The scene was one of fairyland enchantment, heightened by the throng of prettily costumed ladies, who with their gentlemen escorts, filled the large reception rooms to overflowing. As the guests entered the residence they were received by Miss Elizabeth Fairbanks, and in turn presented to host and hostess proper by Mrs. Wellington Bell. In the parlors the guests were received and entertained by the daughters of Mr. and Mrs. Fairbanks, Mrs. H. B. Higbee, Mrs. A. B. Hill, Mrs. Gus Fairbanks, Mrs. Eva Fairbanks, Miss Elizabeth Fairbanks, Miss Dacia Fairbanks. Col. Fairbanks also assisted with the entertainment of the guests. Mr. and Mrs. Fairbanks received their guests with hearty hand-clasps and returned the compliments of the visitors with right good will. The were both in happy mood and none present were more merry nor sprightly than they. A striking feature of the reception was the Japanese tea garden. This was arranged on the lawn closely adjoining the residence on the east. A canvas covered enclosure was bedecked in Japanese fashion, large Japanese fans, parasols, lanterns and other peculiar Japanese knick-knacks being used with pretty effect. In the tea garden were ten tables and around these the guests gathered in merry groups and partook of the bounteous hospitality of host and hostess. Presiding over the tea garden were the following ladies: Mrs. Capt. Fox, Mrs. C.R. Winfield, Mrs. Will Beggs of San Francisco, Mrs. Rebe Nourse of Sacramento, Miss Clara McNear, Miss Gertrude Shelton, Miss Margaret Grant, Miss Ruby Fairbanks and Mrs. Capt. Maclay. It was a pretty nook and many were the words of praise spoken by the guests as they entered and lingered therein. On a small porch on the east side of the residence a cosy corner was arranged for the gentlemen. Here they gathered, old and young, to smoke fragrant Havanas and exchange comments and recollections brought to mind by the occasion. Mr. and Mrs. Fairbanks were the recipients of many handsome presents. One of these the one perhaps as much prized as any, was a handsome cut-glass punch bowl with accompanying glasses and a beautiful ladle of gold. It was a present from the directors of the Petaluma Savings Bank of which Mr. Fairbanks is and for more than thirty years has been, the president. The handsome gift from his business associates was especially pleasing to Mr. and Mrs. Fairbanks. Another gift that excited the admiration of all was a very large and beautiful floral piece in the shape of an immense horse shoe sent by A.O. Hale of Hale Bros. & Co. The exquisite floral offering was tied with very wide streamers of ribbon and upon one of these was printed in golden letters: "The Greatest Boon Must be the Fiftieth Honeymoon." Hiram Tolbert Fairbanks and Miss Lucinda Moffett, the latter the daughter of the Honorable and Mrs. Levi Moffett, were married at the home of the bride's parents at Augusta, Iowa, in 1852. In 1859- Mr. Fairbanks brought his wife and family then consisting of four children across the plains to California. They arrived in this city in the fall of '59 and have resided in Petaluma almost continuously since that time. Mr. Fairbanks engaged in the lumber business and farming for two years. He next engaged in the mercantile business here but sold out in 1869 and went east on a visit. Returning to this city he entered into a co-partnership with the late A.P. Whitney in 1870-1. It was in 1870, also, that Mr. Fairbanks established the Petaluma Savings bank of which he became President and which position he has held uninterruptedly. Mr. Fairbanks has been a long time in Petaluma and during his residence here his connection with the business world has been steadfastly honest and upright. He has served three terms as a member of the city council and has always been prominent in public affairs. The Fairbanks home, so graciously presided over by Mrs. Fairbanks, has a state-wide reputation for its hospitality. The doors of the Fairbanks home have ever been open to the merry young folk of the town and community and many have been the social functions that this genial couple have provided. The Argus joins the hundreds of friends of the couple in the wish that Mr. and Mrs. Fairbanks may live to celebrate their diamond wedding a few years hence and that the path they shall tread in the remainder of their journey in life shall be strewn with the roses of happiness and that they may ever enjoy the perfect contentment they so richly deserve. The music for the reception was furnished by Newburgh and Smith's orchestra stationed in a secluded nook in one of the parlors. The music was admirably rendered and tuned for the occasion. Among the guests from abroad not before mentioned were Judge and Mrs. Albert G. Burnett, Judge and Mrs. S. K. Dougherty, M. Doyle and others from Santa Rosa; A. Shroyer of Fruitvale and Wm. Topke of San Francisco. !CENSUS: 1910 California, Sonoma Co., Petaluma Twp., Petaluma City, ED 150 SH 3A LN 13 ENUM 4 MAY 1910 Address is now listed as 758 D Street. Hiram is now a widower, parents are listed as NH and NY. Also enumerated in the household are daughter Julia Higbee and Elizabeth Hill and their families which are described fully in their notes. In addition daughter Dacia is still living at home. Occupations for the father and the two sons in-law are listed as "own income". !RESIDENCE: 1915 758 D St., Petaluma, CA; Historic Resource Inventory Sheet at the Petaluma Museum; References: Argus Courier, Development Edition, 1915. 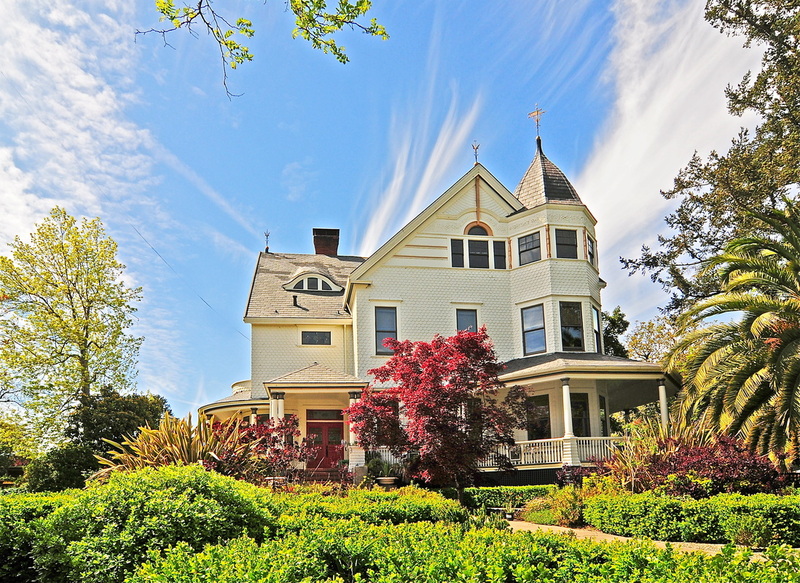 This is certainly one of Petaluma's most distinctive residences. It is very large mansion-like with carriage house and extensive gardens. In the 1915 edition of the Argus Courier Development Edition, this house is pictured belonging to H.T. Fairbanks. Mr. Fairbanks was a prominent citizen and investor in Petaluma in the 1880's and on up (sic) the early part of this century and was President of the City Board of Trustees for three terms. He was one of the few early residents of Petaluma that had success in the mine fields. This house reflects the success of H.T. Fairbanks in its generous proportions and extensive grounds. Also listed in Petaluma's Architectural Heritage by Dan Peterson, 1978, p. 69 includes photos and architectural description. !BIRTH-MAR: "Genealogy of the Fairbanks Family in America, 1633-1897", by Lorenzo S. Fairbanks, A.M.; Boston; American Printing and Engraving Co.; 1897; CS 71 F164 1897; p. 488-9. Born Dec. 29, 1827, in Manchester, Indiana. When 19 years old he emigrated to Iowa, settling in Augusta, Des Moines county, where he made his home with the Hon. Levi Moffett. In 1849 he returned to Indiana and the following year he crossed the plains to California where he engaged in mining with his brother, Augustus D. Fairbank[sic], at Mormon Island, on the south fork of the American river. Success attended him in his mining operations, and he returned to Indiana in 1851, going from there to Iowa, where he followed merchandising. In addition to his mercantile pursuits, he engaged in milling, which he followed with success until 1859, when he again crossed the plains to the Golden State taking with him his wife and four children, and arriving at Petaluma in the fall. He engaged in farming, in connection with the lumber trade, until 1861, when he abandoned agriculture, and established himself as one of Petaluma's merchants in 1862, and also opened a commission house in San Francisco. Seven years later he disposed of his business in Petaluma. In 1870 he retired from the commission business in San Francisco, and embarked in the mercantile trade, with the Hon. A.P. Whitney, in Petaluma. He was one of the founders of the Petaluma Savings bank, which was organized in 1870, and has been its manager and president ever since. Besides his interest in the bank, of which his eldest son, Col. D.B. Fairbanks, is cashier, he and his sons own the extensive plant known as the Golden Eagle flour mill, in Petaluma, conducted by J.F. and W.H. Fairbanks, and a fine large ranch in Humboldt county, managed by Augustus Fairbanks. He owns an elegant house on D street, which is in striking contrast with the old Fairbanks home in which he first lived. The name of Fairbanks is indissolubly connected with the growth and prosperity of Petaluma. Hiram T. and his sons stand in the front rank of its leading citizens, and are widely known for their financial ability, unblemished records and rigid integrity. He married July 14, 1852, Lucinda, daughter of Hon. Levi and Elizabeth (Keek) Moffett, of Augusta, Iowa, who was born in Orangeville, Iowa, March 2, 1833. !DEATH-BURIAL:Cypress Hill Cemetery records, 430 Magnolia St., Petaluma CA. Jane Risser visited Cypress Hill Cemetery, Petaluma 31 AUG 1990. She photographed Fairbanks family plot and spoke to secretary at cemetery. Wife Lucinda Moffett and 7 of 11 children buried here. Another of the widely known citizens of Sonoma county, whose name for years was prominently identified with its financial and business circles, has crossed the great Divide. At 11 o'clock last night at his beautiful home in Petaluma Hiram T. Fairbanks died. About 11 o'clock yesterday morning Mr. Fairbanks suffered an attack of apoplexy from the effects of which he did not rally, death ensuing at the hour named. The deceased had many old-time friends among the pioneer citizens of Santa Rosa and Sonoma and Marin counties. Mr. Fairbanks was born in Indiana, December 29, 1827. When nineteen years of age he went to Des Moines county, Iowa, and year later joined the United States troops and fought in the Mexican war. With the vast stores of wealth in Califonia mines as a magnet he was drawn to the Pacific coast in 1849. Accompanied by his brother, he struck a rich vein of ore on the south fork of the American river, twenty-five miles from Sacramento. With wealth acquired in mining pursuits he returned to Indiana in 1851 and shortly afterward moved to Iowa, where he established himself in business. Accompanied by his wife and four children, he again crossed the plains to California in 1859, and first took up ranching near Petaluma in 1860. Two years later he abandoned ranch life and established a mercantile trade in Petaluma with a commercial house in San Francisco. He also abandoned this work for several years and did not engage in trade again until 1871. The year previous he helped found the Savings Bank of Petaluma, of which institution he was president for several years. Then he served several terms on the board of trustees as president, and was president of the Golden Eagle Milling Company. The closing years of his life were spent in retirement from active business interests. !OBITUARY: Wednesday, June 30, 1915 Petaluma Argus. Copy in possession of Nick Cimino. The following year he enlisted in the United States Army for service in the Mexican War. The year 1849 found him starting on an overland trip for the Pacific coast, from Indiana, where he found himself at the close of his enlistment, his stay being brief for the mining excitement appealed to him strongly, and he could not resist to make a try in the then unknown west. He arrived safely and with his brothers, he mined at what was then known as Mormon Island, on the south fork of the American river, about 25 miles from Sacramento. Designated a Heritage Home Society award winning restoration, this lovingly maintained three story estate of grand proportions boasts a wide variety of architectural textures and window styles. It features a five sided corner tower, a wrap around veranda, an in-ground pool, two patios, and a pergola. The lush gardens are outlined by a stone wall that includes an inscribed carriage step on D Street to assist present day lady guests arriving in modern horseless carriages. The grand entry hall of this stately residence invites you to an interior of high ceilings and spacious rooms that are beautifully detailed with marble, oak, hardwoods and magnificent mill-work. Stained glass windows and three working fireplaces enhance over 8500 square feet of living area consisting of 8 bedrooms, 5 1/2 baths, a remodeled gourmet kitchen and a basement with a 3 room office suite, workshop and wine cellar. One of the finest homes in the region, this estate has been featured in numerous television commercials, has hosted Petaluma's annual "Music in the Mansion" series since 1989, and has been a frequently used site for special occasions including community fundraising, weddings, and elegant entertaining.